The Abaco Club on Winding Bay is the perfect tropical paradise for the affluent to unplug and unwind in a luxurious yet casual manner. As South African PGA pro Thomas Aiken explained on the creamy powder beach, “This is a place for rich people who don’t need to be seen. They can have anything they want and this is it. 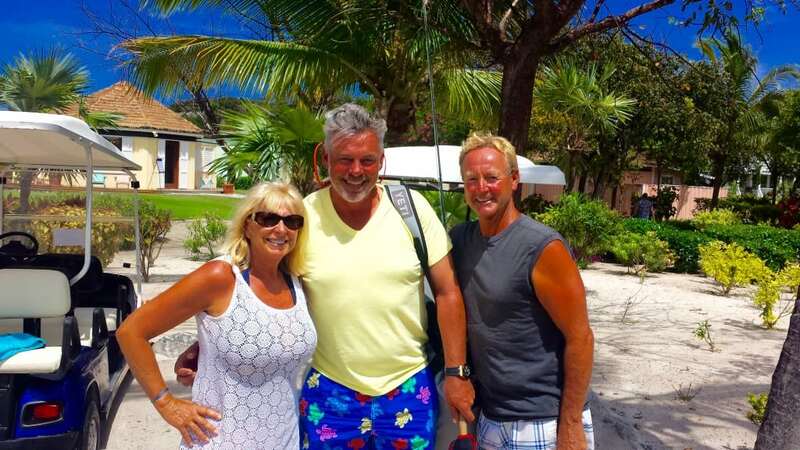 Where else can you catch a marlin, a bonefish, golf and go back to the beach within two miles?” Tom likes hanging with the members from around the globe who have common interests and enjoy “the barefoot luxury. 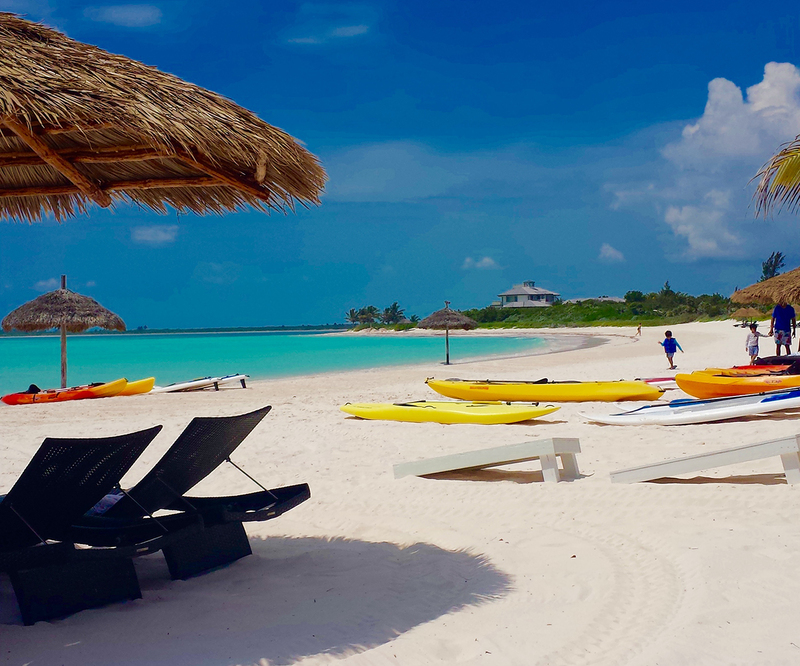 The Abaco Club is all about families and friends getting away to treasure each moment of activity and leisure. Neither kids nor adults sit around clicking keys to cyber space. 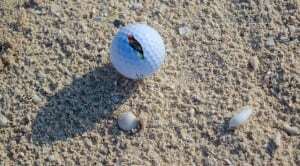 Instead, they relax or play in a space of simple natural beauty on the golf course or tennis courts, or two-mile long beach and ocean. The play options are endless. 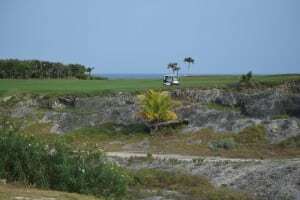 Golf could not be any sweeter than at the Abaco Club whether in the practice area or on the course. No tee times are required. 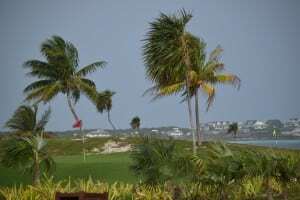 Just show up at the little proshop and off you go on fairways winding through the island bush of Abaco and out by the serene blue sea. Native terrain is preserved by the absence of cart paths except the stone lined strips between greens and tees and climbing up the steep hill to number 15 where the ocean comes into view again across a deep chasm. The dramatic ocean play crescendos along the 18th fairway with pounding waves. The beach is mirrored in sand bunkers with a smattering of tiny seashells. 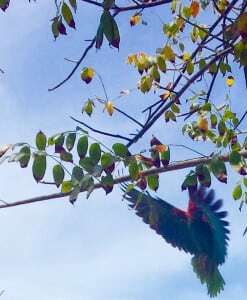 Curly tailed lizards scooting across rocks represent the only gallery along with the green silhouettes of Abaco parrots that squawk before flashing their striking bright tail feathers in flight. and Bahamian Sands brewed in Freeport are the local rivals. Breakfast, lunch and happy hour are served at Buster’s as well as the weekly Rib and Rakes ‘n Scrape Night. This is a stupendous barbeque buffet with marshmallow toasting at the firepit. In case of inclement weather, it is relocated to the Cliff House, a fine dining restaurant perched next to the pool for a grand view. This is where grandparents, parents and kids dance after the bbq with the local Rakes ‘n Scrape band. 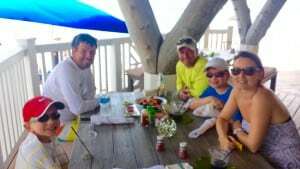 A day at Abaco Club on Winding Bay starts any way you want and continues in the same fashion with friends and family. The sun rises over the cliff side homes illuminating the first turquoise hues of the ocean. A long beach walk to the peninsular high rock starts the blood pumping. Have a little breakfast and hit the links or courts or fitness center looking over the bay and then enjoy a massage in the spa before or after the sauna. 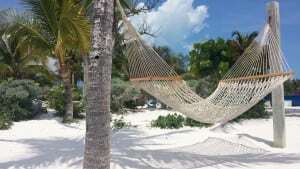 Swim or wade out with the green sea turtles to the little island, Sugar Cay for lounging or snorkeling on the reef. Or go by a glass bottom kayak or stand up paddleboard over the crystal clear water. Sail on a Hobie Cat or glide silently on the electric powered Funcat with fingertip control. All water toys are inclusive and without any contention because of the exclusivity of the membership. Members vacation here at different times year round so a board in the reception lounge shows who is currently on property. The golf carts also give it away as names are attached even for visitors. You too can check in under the rental program and receive the key to your home away from home as well as a golf cart for exploring the idyllic community. The sign by the steering wheel says stay left – not a political statement but a reminder to drive on the left side of the road, the British colonial way. 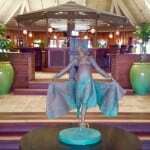 If a first time visitor, Zeke or another Bahamian driver will guide you around the gorgeous grounds by the golf course and Buster’s Beach Bar then up, up, up to the Cliff House for the most elevated and breathtaking view of the property. You just know this will be a very special time, a special place in your life and for the duration, time almost stands still. Cabanas, cottages or estate homes are available to rent from $495-$2999 per night for anyone wanting a preview. Beware you might make an investment decision to buy or sign up for membership like Giles did. We met him first on the golf course with his young son. 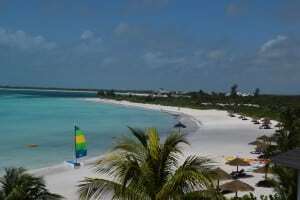 His family became one of the early fractional purchasers when visiting Abaco on vacation. They fell in love as Thomas and other owners did with the island paradise and bought on the spot without regrets. It guarantees that they are bound to frequent their Caribbean hideaway. Original club members have seen the property transition from Ritz Carlton to Marriot and now Southworth Development. These members are the glue that kept it together like a family through the various community ownerships and they are happy with the new regime. 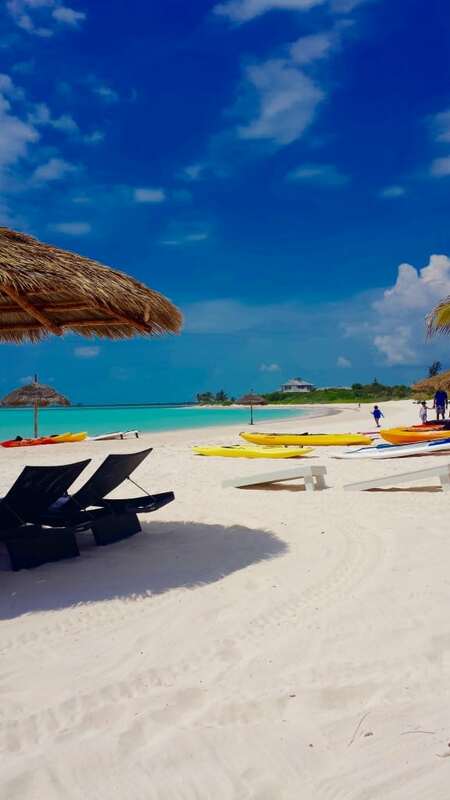 Committed to enhancing the luxurious element while preserving the authentic Bahamian nature, Casey Counsellor with Southworth Development is the new GM, transferred from the beautiful Creighton Farm development in Virginia with his wife. Not a water activity fan, this mom, grandma and artist, has transitioned to island life by creating art from seaglass she collects on the beach and by giving back to the local community. They are both settled in for the long term and making friends. 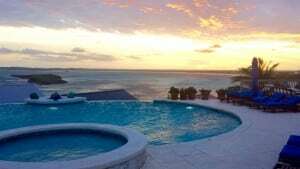 The Abaco Club on Winding Bay changed it all by building infrastructure and yet left it so much the same. Bahamians might leave for a better education and then return home because “it’s just living in paradise,” according to Zeke. Ryder Cup Captain Darren Clarke agrees. While he loves the golf course he says, “Fishing is more fun.” All the buzz was about his rare permit fish catch while we were there. The saying “there are many fish in the sea” is unfortunately not true in popular waters that have been fished out. It is very true around the outer island of Great Abaco. 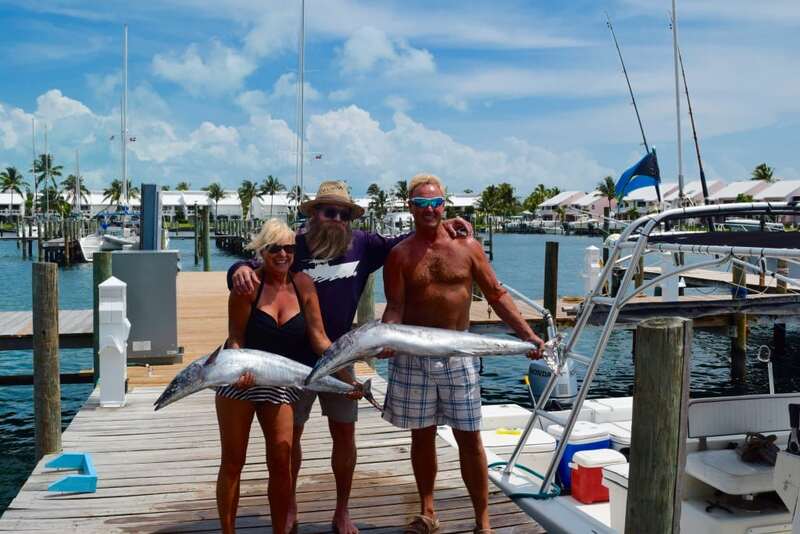 We were thrilled to catch two wahoo with Captain Mark while on the island and three conchs with Captain Charlie in Little Harbor a few minutes from the Abaco Club on Winding Bay. 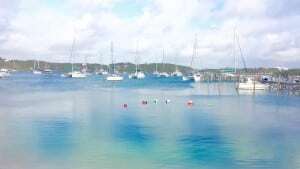 This is where members may dock their own boat or charter one. 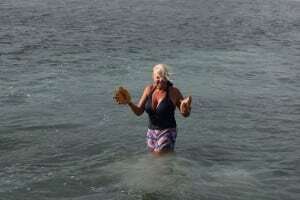 In season lobsters are speared right in the cove at The Abaco Club. Where else can you swim for your supper? Steam them in your kitchen or have the chef cook them up at the Cliff House. Bahamian fishing off the dock with simply a line and hook is another option. Each morning a newsletter is delivered to your golf cart with the week’s activity schedule. Sign up at the beach hut while grabbing your towels. Also noted are dining specials, the weather, fun facts about sea life and a featured staff member. The golf superintendent wanted his Bahamian staff to understand the game so he designated Wednesday afternoons for their play. Thomas would play with them, which upped their games. One first timer hit it 300 yards. 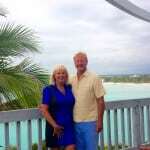 They never knew golf before the Abaco Club and now they love it.